Steven Kasher Gallery is proud to announce Mister Finch’s Handmade Museum. This is Mister Finch’s debut gallery exhibition. Made from stained and painted cotton fabric tailored to dazzling effect, Mister Finch’s Handmade Museum showcases over 50 new sculptures by the artist. 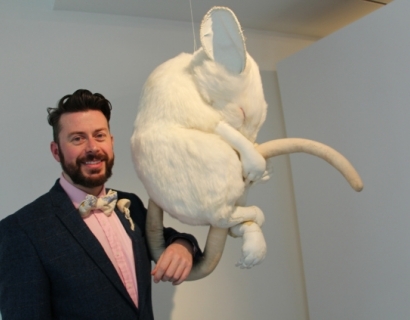 The exhibition is a cabinet of curiosities housing specimens both pretty and poisonous from the wondrous world of Mister Finch. The exhibition immerses the viewer in slightly subversive wonderland where poetry awakens from decay. 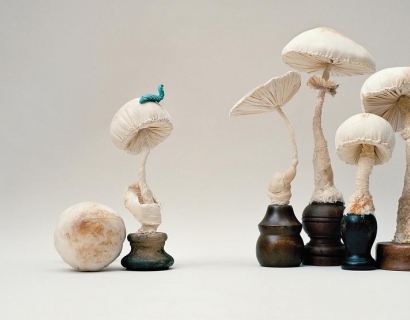 Over-sized toadstools and fungus sculptures take inspiration from bonsai trees, antique naturalist specimens, and the colors and textures of Japanese netsuke. They grow out of wooden bases sourced from vintage lamps, furniture legs and wooden bowls. They mimic the natural positions of fungi found in the wild and in the imagination. 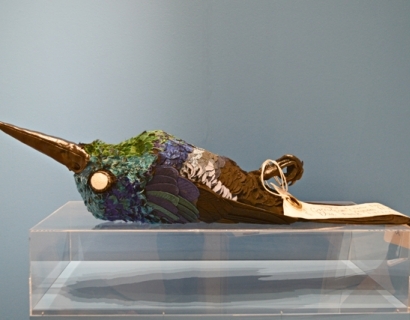 A display case, appointed as one might find in a 19th century apothecary, showcases a collection of tightly stitched birds. These intensely detailed pieces, battered and frail, are a quiet but poignant reminder of life’s cycle. 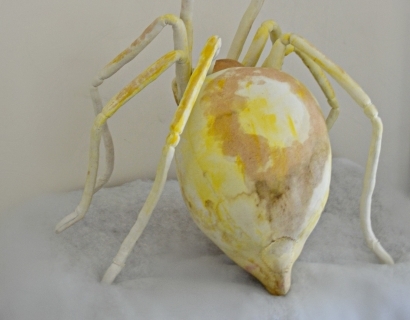 A collection of huge and plump spiders, the largest ever created by the artist, sit in stark contrast to the minutely delicate works held in display cases. These enormous creatures, the largest over 5 feet tall, are ready to pounce at any moment, some hanging down from a single thread, shifting from peaceful to malevolent. Over the last several years, Mister Finch has amassed an eclectic mix of upcycled and new materials: discarded wire, steel, and wood, vintage tablecloths, antique silverware and rescued cottons. From these he creates his woodland creatures. 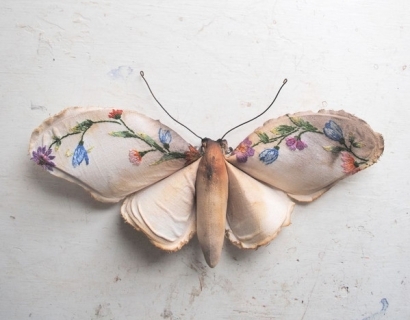 British folklore and the life cycles of insects and flowers are literally and figuratively woven together in his stuffed sculptures. Though he has no formal training of any kind, his mastery of the needle can be seen in intricate details of his impeccably hand-sewn menagerie. A textile artist from Leeds, England, Mister Finch began his career as a jewelry designer. After leaving the fashion world, he devoted himself to working exclusively with textiles. After garnering a cult following on Etsy, he installed his debut exhibition, Cinder Embers, in November 2014 at the Anthropologie flagship on Kings Road in London. His first book, Mister Finch: Living in a Fairytale World, was published by Glitterati in 2014. Mister Finch’s Handmade Museum, will be on view June 4th – July 31st, 2015. Steven Kasher Gallery is located at 515 W. 26th St., New York, NY 10001. Gallery hours are Tuesday through Saturday, 10 AM to 6 PM through July 10th. Summer Hours begin July 13th, Monday – Friday 10 AM to 6 PM. For more information about the exhibition and all other general inquiries, please contact Cassandra Johnson, 212 966 3978, cassandra@stevenkasher.com.